4 Things I love about my husband: I love that I am constantly being reminded that I have no husband, and probably will not for many years, in little places like this. I love that the last several boys I have dated never came close to becoming my husband (no sarcasm there, except with the last boyfriend...). I love that when I look around, I do not see anyone that even remotely resembles the kind of person I want to marry but one, and he changed his mind. I love that I have no idea what else to write here that is, in any way, relevant. 4 movies that I would watch more than once: Benny and Joon, Singin' in the Rain, Eternal Sunshine of the Spotless Mind, The Ultimate Gift. 4 Places I've Been: Top of Glass Mountain, 18,000 feet high in a gulfstream 450, Carmel beach at sunset, Rock climbing in Mammoth. 4 Places I would like to go: Through the Oakland Temple, Prince Edward Island, Ireland, Thailand. 4 People who email me regularly: Mom, dad, Elder Blue Star, and, um, mom. 4 things I look forward to in the next year: Graduation, entering a Master's program, possibly moving away from CA, buying a car. 4 people I tag: Helena, Annette, Michele Cabiness, and Tiffany Staley. Good morning, world. 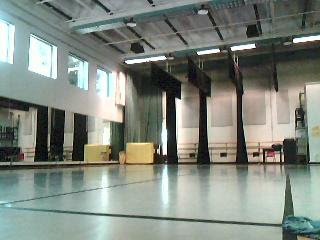 I am writing from my favorite corner of the main dance studio at CSU Fresno. Great facility, part of it shown above. These days are going by at the speed of light. 6am rehearsals almost daily followed by long days of school and work. I am just about worn out. This week, in particular, has been the week from Haites. Were Baz Luhermann to knock on my door tomorrow to request the making of a film of my life to this point, sure as sunshine, the final scene would be a montage of me breaking into hysterical laughter and sobbs back and forth all week. It's midterm week. It also happens to be the week my big term paper is due in Gerontology (like an idiot with no foresight, I selected the subject: "The Burden of the Care-Giver". Can we say "most depressing ten pages EVER"?!). The coup de grace, a weekend performance in The Central Valley Dance Festival, presenting a piece that my choreographer cannot make up her mind about. We have learned this piece four times over, she has changed it so much (even in the rehearsal that ended an hour ago... We Are Performing This TOMORROW)! Kill me now. I was looking forwad to Sunday, when I can finally relax and begin a new, calm week, until one fellow-student reminded me what happens after Midterms. WE KEEP GOING! Obviously, we all knew this. But somehow, when she said this, it took hold of my stomach and pulled down, HARD. We have decided that midterms are, indeed, FAR worse than finals because of the simple fact that the semester only becomes more intense thereafter. I am accustomed to preparing for a big concert around finals, holding my breath with the end in sight. This semester, having a huge show smack in the middle of things is acting as a strange illusion. I am ready to be done, yet there is SO much more to come. Ealier in the week, I was attempting to calculate how long it would be before I would be able to get more than four hours of sleep per night again. My initial finding was Saturday night. That may be true, but Monday fast approacheth and I must have four minutes of choreography freshly painted to my body for display Monday night. Sunday will be church and prep. Work is work. I still love and hate my job. Despite the busy schedule, I am maintaining decent grades. I have earned A's on all my midterms so far, and my overall grades should still reflect that. Halfway there. Lots of Prop 8 work going on. I feel pretty terrible about my lack of involvment, aside from my monetary contributions. My roommate suggested that I simply spread the word at school and work. Ha. Attempt to spread the word on Prop 8 in the THEATRE ARTS department of my school and I will have immediately burned every bridge I have developed there. Spread it at work where I may get an abundant response of agreement, but if my boss finds out, I'm dead. and she will find out. The official language of my place of business is not English, it's Gossip. Still, I can do my part in small ways. That's all I've got. Miss you all. To those of you headed to Utah this weekend, you stink for choosing this moment in time. Give Aunt Jeanie a few HUGE hugs for me, toss Wendy a Hi Five, hug the Wibergs an extra time for me and tell Grandma I love her very much. And trip anyone I didn't mention that you might see there. Oh, I meant hug. Hug them. Not trip. Walking along today, I came across a vendor's faire outside the Student Union at Fresno State. I decided that I would very much like to have a picture for our sadly barren walls at home, something my roommates often complain about. Sinatra can make any home more attractive. Tada! Then, as I was walking away, my eyes fell upon this masterpiece.... Had to have it. I LOVE this painting. Score points for Laura. Gold star day. Despite all the gloominess. I was going through photos, wondering what to do with my vast collections of completely random pictures, and I thought I might share some for no reason at all. If I have posted any of these before, don't tell me. I don't care. We caught this fire hydrant deliberately breaking the law. Lovely view over a lake in Mammoth. Tunnel Vision!!! I find this entertaining. Last night, my roommates kidnapped me at 11PM and took me for a drive. I suppose I have been visably depressed lately, and they said it would be good for me. We just went driving around the foothills, listening to good old music. Every so often, my roommate, Lori, would say "Oooo, this is a good spot. Let's get out and take a picture here" or something to that affect. We obeyed. Laura, Lori (RS Pres. #3 in my life), and Kristen. Have I mentioned that I have the cutest roommates ever? Because I do. I think these are the stars... I tried, in vain, to take pictures of them several times; they were amazing. Laura, Kristen, and Lori, Decisively adorable. Here we are with some pretend ducks. And much more clear, the same ducks. Because Lori thought they were cool. A close-up of Lori's teeth, because Laura does not know how to use her camera. Or maybe she does, and this was done for effect so that Little Peanut Lori wouldn't look so little (she measures in at four feet, two inches, or something ridiculously short like that. It's the cutest thing in the world). I felt much better by the time we got home at 1AM. Thanks, Lori and Kristen. I love you ladies. MANY MOONS AGO, SCOTT AND I WENT TO A MAJOR SHOPPING CENTER IN FRESNO CALLED RIVERPARK. BORED OUT OF OUR MINDS, WE BEGAN TAKING PICTURES OF EVERYTHING WITH THE INTENTION OF CREATING A STORY LATER. MONTHS AFTER THE EVENT, WE STILL HAVE NOT COMPLETED OUR EPIC TALE. SINCE "WE" ARE NO LONGER, I THOUGHT I'D SHARE WHAT LITTLE WE HAD CREATED TOGETHER THUS FAR. WE MAY NEVER SEE THE END. BUT, AS MARTHA GRAHAM ONCE SAID, "NO WORK IS EVER COMPLETE. IT IS ONLY ABONDONDED". HERE LIES OUR ABANDONMENT. Once upon a time, in a land far, far away (ok, not that far. I mean, all you have to do is hop on the 41 north and drive about ten minutes... from where I currently live. So I guess it is a land far far away from most of you... but I digress.......) There was a girl wandering around, bored out of her mind on a relatively dull night (though she would never admit that to her mother, who would surely travel the distance to where she was and drop a chore list in her lap, as was traditional punishment for such complaints in her home). This girl was named Laura, and she was an amateur under-water basket-weaver hoping to one day to become a great weaver of under-water baskets. But no matter how long she pondered the right way to go, Laura could not decide. Not far from here, an incredibly handsome, tall young man named Scott was roaming in search of amusement. Scott was a hero who roamed the city using his moderately-super powers for good (sometimes for awesome). Here he is leaping (ok, falling, but in a very hero-like way) off a two-foot ball thingy with a single bound. Heros who spend their days doing awesome can often grow lonely too. About the same time that Scott was ready to collapse in on himself like a dying star from the weight of the loneliness, he noticed something remarkable. From afar, he saw Laura wandering around, looking rather confused. He had no idea who this bombshell was, but he knew he had to meet her. He couldn't reach her through the crowds of people surrounding them, and she was wandering away. So he hopped into his galactic-traveler mobile (which was his preferred method of transportation, no matter how long the distance), and headed her way. Thanks to the low number of galactic-traveler mobiles that were driven in this area, the crowds were not accustomed to parting for a light-speed vehicular transport to take off, and Scott's transport was unfortunately just one model earlier than the one with vertical lift and hover included. So Scott couldn't get anywhere. Much like the Hulk, Scott grows when he is angered. His road rage made him grow to a size not suitable for his stransport. He managed to calm himself by singing "I feel pretty", as he learned to do in his all-time favorite movie "Anger Management", returned to his normal size, and ran his rear across the grounds to where Laura had been, taking only a short break in this recliner because it was calling his name (well, it was saying "Scooty", which, though odd, he supposed was close enough). Ok, rested and refreshed, Scott got back on the chase and found Laura almost exactly where she had been prior to his rest, as she was wandering in circles, completely lost. Oh yes. He was smitten. You might even say he was "in deep smitt". He saw her.... She saw him.... *SIGH* (not a whimpy sigh, either. it's one of those big, long, "aw, I just read the most romantic thing ever, whimper whimper whimper" sighs). Except for the parts that were unhappy. Manic Anne was so evil. Look at how evil she is. Just look at her. She's a crazy person. Manic Anne devised many schemes to permanently separate Scott and Laura, thereby causing them both great unhappiness for the rest of their lives because she hates hem so much for some reason. (It's probably something very long-winded and tied into the family background. Y'know, something neither Scott nor Laura could ever control. Like, uh, Scott's great-great grandfather probably started casting Manic Anne's ancestors in plastic instead of iron, so they weren't as durable, or maybe Laura's great uncle's cousin twice removed was the one who decided to make Manic Anne's mother one of those detachable mannequins whose hands and legs can come off, making it easier to dress them for store display, but ultimately leaving the mother unable to ever comfort and sooth her child with a simple pat on the head. Maybe Manic Anne only ever got bopped with a stub because her mother's hands were constantly falling off. It had to be something twisted and sad like that). One day, Scott was at home asleep in his bed, while Laura was tidying up the place. When Laura looked over and noticed that Scott was looking slightly dead. Laura screamed and rushed to his side, which woke Scott from his death-like slumber. Scott JUMPED out of bed, startled by Laura's screams. "I did? That's weird. I had the craziest dream that a pale white woman tried to kill me by hitting me with her car! ", Scott replied. "A pale white woman? Did she have a fierce look about her, like she could belong in a window display of any number of high-end fashion shops? ", Laura inquired. "Why yes, yes she did. How did you know? ", Scott asked, confused. "That's Manic Anne!!! ", Laura exclaimed. "Who's Manic Anne?" Scott asked. "Hellooooo, she's only our greatest nemesis! Scott, you really should read the story if you're going to be in it. ", said Laura. It was time to do some research. So Scott headed to the nearest library and read up on "Defeating Nemeses For Dumbies" (Not that Scott is a dumby. Those are just very helpful books). While he was inside, a tiny circus bus drove by and kidnapped Laura! This must be the work of Manic Anne!!!!!! THE REMAINDER OF THIS TALE HAS BEEN OFFERED UP AS A SACRIFICE TO THE GODS OF SAD BREAK-UPS. MAY THE NEXT COUPLE TO ENGAGE IN SOMETHING THIS ABSURD FIND SOLACE IN THE END OF THE STORY BEFORE THE END OF THEIR RELATIONSHIP! THE FOLLOWING ARE THE PICTURES WE HAD YET TO FIT INTO THE TALE.